I've heard good things about this book but YA is not really something I gravitate towards. As for author reviews of books, I take them with a grain of salt. Some may be ok, some not, nothing's set in stone. Delia D - It used to be the same with me until now: I have very little free time, so breezy young-adult novels just don't seem as boring as they used to. This one's actually good, if you ever find yourself in the mood for YA! Wow, I didn't know some authors reviewed other books. 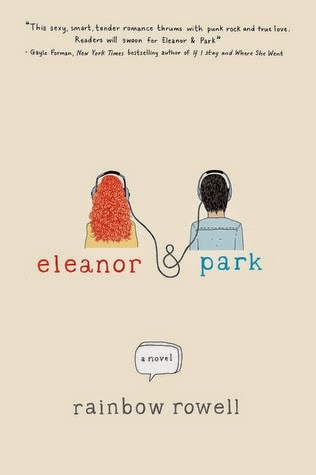 I have been curious about Eleanor and Park, but wondered if it would be unbearably super cheesey. I am not very fond of YA, but so many reviewers are going gaga over Rainbow Rowell's books, it feels like I should try one at least. This sounds ok, but I am not sure about the super cheesy romance part. Nishita - See, I'm not a fan of YA either so the stereotypes did bother me, like I said, the sickly sweet romance was a bit annoying. But it was entertaining and certainly well written! So as far as usual YA goes, this was great. Give it a go!